Can't decide which glitter ones? Order Glitter Pastease by the variety pack. 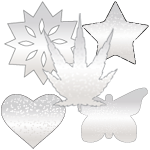 This Item: Pastease® Glitter Variety: 3, 5, 10 & 20 Pair: FREE Shipping!